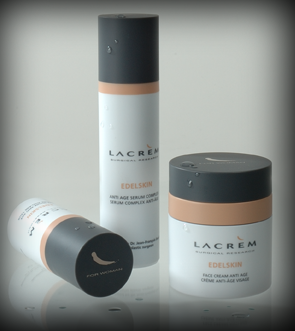 The "LACRÈM"® products are the result of close cooperation between a large Swiss research laboratory and Dr. Jean-François Emeri, a specialist in plastic and reconstructive surgery. With age the skin becomes finer, loses flexibility and firmness. Little by little the small wrinkles are transformed into large wrinkles..... Climatic extremes, pollution and stress also weaken the skin strength and tarnish its natural beauty. To fight against these effects, we have devised an exclusive complex combining the benefits of nature with the highest achievements of cosmetic research. The innovative ingredient composition of the LACRÈM line helps the skin to restructure and renew itself. The LACRÈM line optimizes the synergies of the active principles of each component of the products. A very high standard of production and purification enables us to say that the LACRÈM products have the characteristically high Swiss quality.